This allows you to create a new Project ID or select an existing one. To create a Project ID, you must specify an Organization and a Project Name. If this is the first time you are using any of the Unity Services, you will need to select both an Organization and a Project name. The Select organization field is typically your company name. When you first open a Unity Account (usually when you first download and install Unity), a default “Organization” is created under your account. This default Organization has the same name as your account username. If this is the Organization you want your Project to be associated with, select this organization from the list. Sometimes people need to be able to work in more than one organization - for example, if you are working with different teams on different projects. If you need to work with multiple organizations, you can add and manage your organizations on the organization ID web page. If you belong to multiple organizations, they will appear in the list. Select your organization and click Create. The Project name for your new Unity Services Project ID is automatically filled in with the name you picked for your Project when you first created it. You can change the Project name later in the Settings section of the Services window. 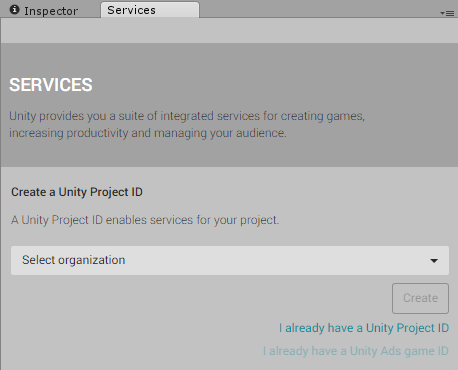 Sometimes you might need to re-link your project with the Unity Services Project ID. In this case, select the Project from the list of your existing Projects that are registed with Unity Services.